This project is very near and dear to me. 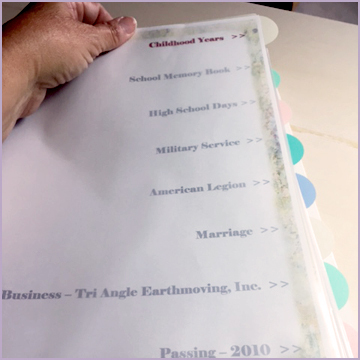 I have actually applied these changes to my parents’ binder and I will be changing all my binders over to this format one by one. The side benefit to working on this project is that I have pulled all my documentation into one place (the binder) and it has become a far better Life Story Book. You be the judge. Here is my research binder after its transformation. If you love the look of the dividers, they are an Avery product (Avery® Durable Write-On™ Plastic Dividers With Erasable Tabs, 8 1/2″ x 11″, Multicolor, 8 Tabs) and widely available at office supply stores. My favorite page protectors to use are the heavy weight non-glare sheet protectors. They are easy on the eyes and give added protection to the document. If you see some borders on pages, I haven’t left them out of the tutorials on purpose; I promise! They are Welcome gifts that I send out to anyone that signs up to be a part of my Life Story Community. I am commited to transforming all our rich family documentation into amazing presentations that will captivate our family’s attention. That’s the goal, right? This has been a project that has made a profound difference in my own Research Binders. As we digitize everthing in our lives, there is still a place for hard copies — they can be viewed any place and any time — even if we don’t have wi-fi! I will be re-working all my albums in addition to any digital Life Story Books that I prepare. I’d love to see some of your own updates – please post them to my FaceBook page, “It’s a Life Story”, email me[Michele at Lifestory dot com], or tweet me a picture[ at MicheleKerr on Twitter]. I would love to hear any stories of family members’ reactions to the binders!